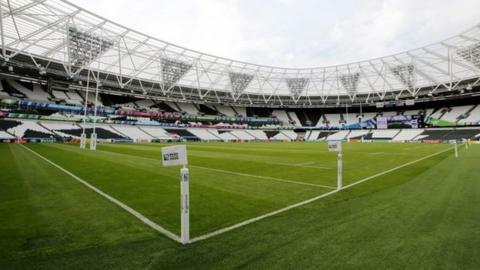 Managers of the Olympic Stadium are to fight a decision to make public the details of a rental deal with West Ham. The London Legacy Development Corporation says it does not want sensitive financial figures revealed. However, it says it will publish some more information about the arrangement. West Ham, who move to the Olympic Stadium for the start of the 2016-17 season, say they would be happy for the entire document to be released, apart from shareholder details. Last month, the Information Commissioner said the corporation must comply with a Freedom of Information request seeking details of the tenancy agreement, but it is now appealing against that decision. "The appeal relates only to information which, if released, could significantly reduce the level of financial return to the taxpayer as it would undermine negotiations with future users of the stadium and other partners," said a spokesperson. The LLDC says it is committed to "maximising transparency" and is preparing to publish more details of the agreement that fall outside the terms of its appeal. A West Ham spokesman said they support the decision to lodge an appeal, but added: "Other than the personal affairs of our shareholders, we are happy to disclose the entire document, the details of which have been accurately reported widely enough already." West Ham were awarded tenancy of the London 2012 stadium in 2013, and £272m has been spent to convert the site for use as a football ground. The club have contributed £15m towards those costs, and will reportedly pay between £2m and £2.5m a year in rent. A BBC documentary said the Hammers were having many of the running costs of the stadium paid for by the taxpayer under the terms of the tenancy agreement. West Ham have a 99-year deal as anchor tenants, which they say guarantees "a viable and sustainable future" for the venue. The Freedom of Information request was made by a coalition of 14 football supporters' groups, who allege the taxpayer has effectively subsidised the Premier League club's move to what is a public asset. A spokesman for the group said the decision by the LLDC to appeal showed it was "running scared of the taxpayer". He added: "We have always respected West Ham United's absolute right as a privately owned business to negotiate the most favourable commercial terms. However it is quite another matter for the LLDC, as a publicly owned corporation, and ultimately responsible to the taxpayer, to seek to block the publication of information about the use of those assets. "The public have the right to know. Fans have a right to know." Hearn: Why is stadium deal secret?